For children, have a question-and-answer conversation about where you’re moving and why. While older children will understand right away, younger ones may not. For toddlers and younger school-aged children, discuss the move with them several times. For children of all ages, give them a time frame for the move so they can get used to the idea and prepare to wind down their school and athletic activities. Take your children and pets to parks and trails located near the new house. Build excitement about the new area by visiting your children’s future school to pick up flyers for activities on-campus or at the local recreation center. Visit the local dog park to meet your neighbours and fellow pet owners, and allow your pet to meet other dogs in the community, too. Give them age-appropriate tasks to help with the move, from moving light boxes to packing their own rooms. Getting them actively involved will give them some ownership of the move and make them feel more comfortable and in control of their circumstances. 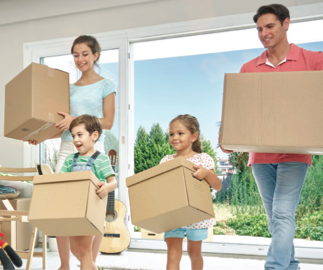 Having someone watch your children or pets the day of the move will ensure you can pack and load the truck safely and efficiently. Knowing your little ones and furry friends may be stressed, anticipate that your sitter’s duties may be intensified and plan ahead. Provide plenty of meal options and treats to keep everyone nourished and happy. For after meals and during drives, make sure your sitter has favourite games and toys to keep the group entertained. Give everyone something to look forward to after the move. Go out for a nice meal and take time to relax in your new home for the remainder of the day. Give your pet their favourite treat or take them for some pet pampering.